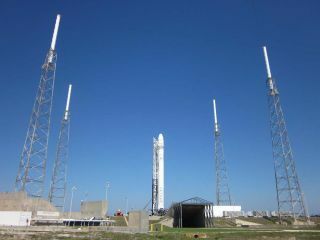 SpaceX's first Falcon 9 rocket to launch an unmanned Dragon capsule to the International Space Station stands atop its launch pad at Cape Canaveral Air Force Station, Fla., one day before its May 19, 2012 launch. CAPE CANAVERAL, Fla. — Nerves are frayed here on Florida's space coast as commercial company SpaceX prepares to launch its Dragon capsule on the first-ever flight of a private vehicle to the International Space Station. The milestone mission is being viewed as a test not only of Dragon but of private spaceflight in general. It will be the first commercial spaceship test flight for NASA's new plan to outsource transportation of cargo — and eventually crew — to the space station to the private sector now that the agency's space shuttle fleet is retired. SpaceX's Dragon space capsule is due to lift off from Cape Canaveral Air Force Station here at 4:55 a.m. EDT (0855 GMT) on top of SpaceX's Falcon 9 rocket. The first 75 hours of the flight are critical to get the vehicle in the correct orbit to catch up with the space station on Monday and dock on Tuesday. The Dragon spacecraft being rotated before it is mated to the Falcon 9 rocket in SpaceX’s hangar in Cape Canaveral, FL. "I think we're going to be biting off our fingers between now and hour 75," SpaceX president Gwynne Shotwell told SPACE.com during a press briefing today (May 18). "I don't think there's going to be a lot of sleep in the next 70 or 75 hours for the folks at SpaceX." The gumdrop-shaped Dragon has flown only once before, a successful test flight in December 2010 that sent it to orbit and back. However, that flight lifted off after a first attempt was called off because of a minor technical glitch. Shotwell herself admitted that the rocket has never successfully gotten to T-Zero (launch time) in a launch countdown on the first try. "We have not hit a T-Zero yet," she said. "However, our team learns more everyday about this vehicle. I'm going to give myself a better than 50-50 shot of lifting off tomorrow, and if we lift off I believe we'll make orbit." Both SpaceX and NASA have been very upfront that failure is an option for this flight. SpaceX experienced several failures during the first launches of its smaller Falcon 1 rocket, and even NASA stumbled through rocket failures during the early days of the Space Race. SpaceX's Falcon 9 rockets, however, have launched on two flights, each of them reaching orbit. "This is a test flight," said Phil McAlister, NASA's director of Commercial Spaceflight Development. "NASA views test flights primarily as learning opportunities. They don't fit very neatly into characterizations of success or failure." If SpaceX is unable to launch the Dragon capsule Saturday, the company will have to wait until Tuesday, May 22, to try again. That's when the next window to launch the Falcon 9 rocekt to the space station opens, SpaceX officials have said. NASA has awarded SpaceX a $1.6 billion contract to develop Dragon and fly 12 cargo-delivery missions to the space station. If tomorrow's flight goes smoothly, the first of these should launch in early fall. Overall, NASA is planning eight Falcon 9 flights in 2013, including two supply runs to the space station and six missions for commercial and government partners, such as communications satellite launches. SpaceX is one of two private spaceflight companies NASA has hired to ferry cargo to the station — the other is Orbital Sciences Corp. of Dulles, Va. This outsourcing plan is intended to allow NASA to focus on pursing travel beyond low-Earth orbit, including manned missions to asteroids, the moon and Mars. "The upcoming SpaceX launch is a thoroughly exciting moment in the history of space flight, but is just the beginning of a new way of doing business for NASA," John Holdren, White House science and technology advisor, said in a statement. "This new way of partnering with U.S. industry is a cornerstone of President Obama's plan for space exploration, and supporting it adequately is essential to maintaining America's leadership in space." You can follow SPACE.com assistant managing editorClara Moskowitz on Twitter @ClaraMoskowitz. Follow SPACE.com for the latest in space science and exploration news on Twitter @Spacedotcomand on Facebook.